Ah, the fun part of driving an RV - RV Parking!! RV Parking can actually be pretty easy - if you do several things before actually trying to do it. 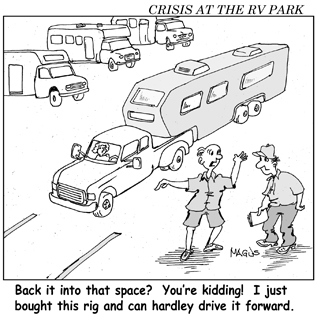 Backing up an RV requires some basic skills, but nothing earth-shattering. I would suggest you practice backing into a driveway or parking area in your CAR first. To feel success quickly, do it all on the driver's side first! Get used to what you are doing ,how you are doing it and what are you using to help you. Once you feel pretty comfortable with your car, then do it with mirrors only and see how well you do. If you can do that comfortably, you are probably ready for the ultimate - RV Parking! Here are several RV parking tricks to remember before attempting to park your RV. Always have an observer/helper with you. The placement of that person is very important. Always, always and always (did I say always?) pull up more than you think you need. Watch professional truck drivers - they always pull up much more than "needed" and have themselves positioned where they want to be - before backing up. Lastly, take control of the roadway! You must take control of the roadway both mentally and physically to be successful. Again, watch a trucker - they put their four-way flashers on and put their truck where it needs to be, to successfully park and back it up. An RV driver needs to do the same - it's BIG and needs to be done right! 1. The helper/observer must be aware of your plans (where do you want to actually stop/park the RV), be in your mirrors all the times and both have established "signals" to help each other. A Walkie Talkie is an awesome tool for this!! As mentioned, all of this should be practiced on the driver's side first. The helper should be far enough back to see the entire rear of your RV, yet always remain in your driver-side mirror. Lastly, the hand signals or audio instructions must be clear and precise. 2. Always pull up more than you feel is necessary. You absolutely want your rear most wheels past the apex of the turn. I'm referring to the curb cut/opening that you are trying to back into. Again, watch truckers - they will always pull their trailer wheels past the "opening" they want to enter. The rear wheels of your RV are the same. They MUST be past that area to allow you to back in quickly and professionally. 3. Take control!! The road is only so wide and you really can't or at least don't want to go on the lawns on the other side. Most campsite spots require you to back into a space on the driver's side. If you are too far over to the right, when you start to cut your front wheels, you'll be driving on somebodies lawn! When you pull up and past your driveway/campsite entrance - position yourself so you are on the wrong side of the road. It won't hurt!! Put your 4-way flashers on, be sure nothing is coming towards you and steer over to the opposing lane and past your driveway. Now, when you start to back into your driveway/parking spot you'll be able to quickly do so, without cutting your front wheels onto someone's lawn. That wasn't so bad was it?!? Have a good helper that knows your plans, pull forward past your entry point and start from the wrong side of the road. Everything will fall right into place - quickly and professionally! In case you missed it on the RV Driving Page, learning how to drive is really important! We've purchased and read the Drive Your Motorhome Like A Pro and found it extremely worthwhile! It's very economical and will certainly help all the drivers of the RV have a better understanding of the methods behind the madness of driving an RV well.